Should I use this plugin or that library? Should I plan this project or dive straight into coding? Should I ask for help or figure it out myself? I know how you feel. I felt the same way. That all changed when I started implementing the below points into my routine. Here are 8 tips to help you to become a better front-end developer. Tip: You don’t need to know everything, just having a rough overview about a topic or technique is fine. You can then dive deeper into it when the right project comes along. Let others filter out the noise and concentrate on the top news only. Be prepared to put up with late nights exploring other websites, experimenting with a new plugins and frameworks, reading web development blogs, listening to podcasts and chewing through thousands of tweets. TIP: Schedule a time for self-development into your week. I know this might be harder if your employer doesn’t support you, but be prepared to invest some of your free time into your own career. BONUS TIP: Setting the podcast playback to 1.5x or 2x speed will help you to get through more stuff quicker. Clients and bosses are demanding, we all know that. Highlighting these earlier in the project timeline will make the whole process from start to finish much smoother for everyone. Tip: Don’t be afraid to call out functionality or feature which is out of your skill set. Being honest is the key, but also make sure you don’t say no to everything. By saying no to everything and only doing the things you are familiar with, you are essentially closing the doors for personal and career development. You will soon drown in the sea of average developers. On the other hand, exploring the unknown will give you a great feeling of achievement, satisfaction and will keep you hungry to learn new things again and again. Tip: Pick a feature, plugin or a technique you wanted to use for some time and implement it in your next project. And if you need, use a mentor to steer you into the right direction. That’s what mentors are great for. This could be your boss, your colleague or someone online who you will follow. Bigger companies might have a formal mentorship program in place, but if you are in a small studio or on your own, look on the internet. Following developers like a Chris Coyier, Paul Irish or getting a mentor through Thinkful or similar programs might be a good idea. TIP: If you are not going forward, you are going backwards, especially in web development. Tip: Remember a mentor is not a guy who will do everything instead of you and is not there to motivate you. You still need to be curious and self-motivated in order to grow. Still with me? Great..thanks, but don’t forget to move. Working in the digital industry means that we spend a lot of time staring at the computer screen. Sitting 40-60 hours in the office will sooner or later take it’s toll. Healthy body and healthy mind means a better code. So when you schedule your week, don’t forget to include some non digital activities – walk, run, gym or whatever else will make you forget about all the pixels around you. Tip: Watching YouTube or TV is not an escape from the tech world and won’t make you feel refreshed. Anything that gets your blood pumping will. I am off for a run now. Agree or disagree with any of my tips? What would be your suggestions and tips for a felow front-end developers? What helped you to bring your career to the next level? Hi! Petr, Your 8 Tips To Become A Better Front End Developer post is really like a 100 tips for me. Very powerful. Thanks a lot! Thanks Rafi, any one tip standing out for you? The No. 2 tip stands out for me. Sounds so easy yet many developers fail to stay proactive. Extremely beneficial I tell you. Awesome list. Been a front end designer for over 6 years professionally (more freelancing) and found that the more research I do (or, web surfing if you will) the better feel I have for current design trends and tools. Trying to create a look that is original yet current can be tough, especially with things like Bootstrap doing so much of the work for you. I like to inspire myself with many styles of sites and even standard art concepts and theories. The biggest challenge I have is color scheming. Great point about the research Versak, thanks for your comment. This is great! Thanks for the quick reminders. I'm currently juggling multiple side websites as well as a full time job. All the tips above are exactly how i'm keeping myself sane! I'm only lacking a mentor :( Let's not forget to test, test, and test! Awesome post this was really help for someone like myself!! Haha, thanks for the nice words Paolo. You're welcome to hang around even though you like tomatoes. Great post, missing out on some things though but will implement them starting this weekend, especially on the last tip that deals with the health, am hardly off my computer but I guess it's time I lay off a little time time to stay healthy, thanks again Petr, great post! HI Daniel, we are all guilty of the last point. It's also a reminder for myself. Thanks your the comment. Thanks for another useful and well-written article, a great resource for webdevelopers who are focused on front-end development. Cheers! I don't usually give feedback but this is well written, and full of good advice :) Good job! Wow, a great and also encouraging post. My only question is how to find the right mentor? Thanks for reading Donovan. You might find your mentor at work, some more experienced developer. Follow the right people on Twitter or stay in touch with my blog. I will be sharing more tips not just from the coding category but also some soft skills that are so ofter overlooked by most of the front-end developers. Petr, this post just came right in time for me. I am in France since 2 months ago working in a 3 month e-commerce. But as I never left my country (Brazil) since I was born, this is being a truly "getting out of comfort zone" lesson. I don't speak French and I can't express myself in English in the same way I do in my native language (and you hardly find French people who speaks English as well). Sometimes I get really stressed watching people doing exactly what you said what's wrong. I confess that in the beginning I did wrong things sometimes because being here makes me afraid of comunicating, and being rejected exposing my ideas to make the project better. Fortunately things are going great and people are recognizing my work for doing things like you said (lots of Google Drive shared to-dos made things faster and all the team could know what was my status without asking for it). Reading your post makes me feel that I am in the right way, of course, there is alot to learn yet. Keep the nice work! Hey Rodrigo, thanks for reading and for sharing your story. Your English is perfect and I am sure you will quickly learn French as well. You don't have another option do you? That's how web development also works. You will learn how to swim when you are thrown into the sea. Good luck with your journey. I like this post. Can I translate this article to other language? I will show the source link. Thank you. I will include a link to the original article and a clear credits in the opening. Nice post Petr. Trello was exactly the kind of tool I had been looking for to track project development. Some of the other newsletter and blogs were great as well. So I work full time around a lot of non-web developers. I really need a mentor in something like .js or .php so any advice on finding mentors like that is greatly appreciated. I think Thinkful becomes costly when you sign up which isn't really my cup of tea. Thanks David. The other option to find a mentor is to regularly attend meetups, user groups and conferences in your local area and build a relationship with more experienced developers that way. Great Post, Keep Delivering such high quality posts. One more Tip: Don"t waste time learning everything from scratch, use available tools and frameworks to make workflow faster. For example as a beginner or intermediate developers you can use Twitter Bootstrap and foundation framework to create responsive design, no need to waste time learning responsive web design from scratch. Use Emmet for faster coding sitepoint.com/faster-workflow-mastering-emmet-part-1/ may be helpful. Great blog. Your blog teaches lot of information to me, that helps me to find better way to reach my goal as a front end developer.. Thanks for sharing an informative blog. You're welcome John, happy to share what I've learned over the years. Realy great tips, have changed my way of working drasticaly after a few fall backs and made up a list in mind how I should work. Nice to read that a few of your tips go along with mine and that others will improve my work. For sure will check out a few of the tools as well. Thanks Petr Tichy for sharing advises. Really inspired me after reading your post! Thanks for the advice sir! You're very awesome and inspiring. Hope i do well in the future, im a web development student and looking forward to be a Front End Developer in the future! I am very eager to learn and i think your tips will help me a lot. Thanks for sharing! Thanks for the perfect write-up. I am working towards front end development. Your post is certainly crisp and with apt references. Really thanks petr for sharing your knowledge. This post was really great and as a newbie like me, it really helps me a lot to move to another steps. GOD Bless. Hi, There! It's very good arcticle to me!! Thank you I'd like to translate and share this article for korean guys, if you agree with it. This post is very old but given detail and point is always new and useful for user.like me i learn about this.and this blog is very helpful that time we develop new website. I can suggest you to visit our blog http://lezgro.com/blog/what-can-go-wrong-with-web-front-end/ Here you can also found an interesting information about front end development. Great Tips & advice, such a great ressource to regain focus and self-motivation (Helpd me to know what should I learn and what to do to keep the good things up, after a very very long nap - I felt retarded after I read about PHP 7, If you know what I mean XD). I so greatful for the links you provided, and looking forward to exlpore them all, that is a very good thing which will save me priceless time looking for deferent types of ressources. Hope I stil have a good english, take care dear Petr! Thanks a lot Man ! You're welcome Salaheddine. Which of the points have you found the most helpful? All of them! But the most imorptant thing for me is that you gave us such helpful links to many good ressources, and that is the most heplful thing. Thanks again ! No probs Reza, glad it was useful. Any of the points resonated the most with you? This sentence "Being honest is the key, but also make sure you don’t say no to everything." For me very useful! Great post man.. Some very useful tips and links. Thanks for this. I always make the same mistake, thanks for the heads up Behnaz! Very straightforward and useful article. Especially I liked the part about investing time for self development. Most of the time developers don't work on their selves and so use the same junk of code over and over again while there are new frameworks and libraries coming up. At any time the demand in the market may shift to new framework as now there is huge demand on bootstrap development, so we always have to update our knowledge. Once more, thanks for this article. A really good and helpful article. Awesome content. Pretty much useful. I've decided to follow all of 'em. Thanks for writing it. Thanks for stopping by Sajed and good luck on your journey. What a eye-opener post,my eyes are now opened after reading this. Thank you, Very useful information for freshers. Thank you for sharing Tips. It's looks like common but very very helpful. I will escape from drown in the sea of average developers.!! Thank you very much. Thanks for sharing such a grate, very informative and useful article to front end development tips. Keep it up. Nicely written and described informative blog post. It is helpful for me. vital information for me. Outstanding post, you have pointed out some fantastic points. Thanks for sharing such a helpful and informative posts. It was definitely worth reading. As a front end developer at the leading web development company, Accend Digital Solutions , i found it as valuable and interesting. 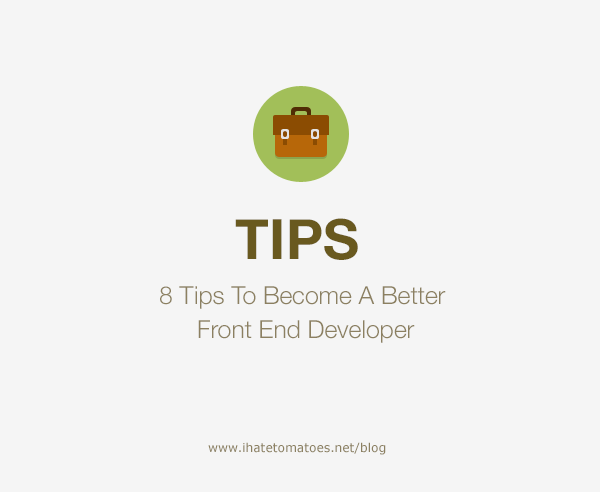 Your 8 Tips To Become A Better Front End Developer post is really like a 100 tips for me. Very powerful. The No. 2 tip stands out for me. Sounds so easy yet many developers fail to stay proactive. Extremely beneficial I tell you. Been a front end designer for over 6 years professionally (more freelancing) and found that the more research I do (or, web surfing if you will) the better feel I have for current design trends and tools. Trying to create a look that is original yet current can be tough, especially with things like Bootstrap doing so much of the work for you. I like to inspire myself with many styles of sites and even standard art concepts and theories. The biggest challenge I have is color scheming. This is great! Thanks for the quick reminders. I’m currently juggling multiple side websites as well as a full time job. All the tips above are exactly how i’m keeping myself sane! I’m only lacking a mentor 🙁 Let’s not forget to test, test, and test! Thank you so much for the tips….. This is the first time I have read an article on this site. I was made aware of it via Twitter and I must say I am impressed with the article and the design and layout of the site. I can’t agree with the domain name though, I love tomatoes!!! Haha, thanks for the nice words Paolo. You’re welcome to hang around even though you like tomatoes. Great post, missing out on some things though but will implement them starting this weekend, especially on the last tip that deals with the health, am hardly off my computer but I guess it’s time I lay off a little time time to stay healthy, thanks again Petr, great post! HI Daniel, we are all guilty of the last point. It’s also a reminder for myself. Thanks your the comment. That was a great complex of important things. I don’t usually give feedback but this is well written, and full of good advice 🙂 Good job! Thanks for reading Donovan. You might find your mentor at work, some more experienced developer. Follow the right people on Twitter or stay in touch with my blog. I will be sharing more tips not just from the coding category but also some soft skills that are so ofter overlooked by most of the front-end developers. Petr, this post just came right in time for me. I am in France since 2 months ago working in a 3 month e-commerce. But as I never left my country (Brazil) since I was born, this is being a truly “getting out of comfort zone” lesson. I don’t speak French and I can’t express myself in English in the same way I do in my native language (and you hardly find French people who speaks English as well). Sometimes I get really stressed watching people doing exactly what you said what’s wrong. I confess that in the beginning I did wrong things sometimes because being here makes me afraid of comunicating, and being rejected exposing my ideas to make the project better. Fortunately things are going great and people are recognizing my work for doing things like you said (lots of Google Drive shared to-dos made things faster and all the team could know what was my status without asking for it). Reading your post makes me feel that I am in the right way, of course, there is alot to learn yet. Hey Rodrigo, thanks for reading and for sharing your story. Your English is perfect and I am sure you will quickly learn French as well. You don’t have another option do you? That’s how web development also works. You will learn how to swim when you are thrown into the sea. Nice post Petr. Trello was exactly the kind of tool I had been looking for to track project development. Some of the other newsletter and blogs were great as well. So I work full time around a lot of non-web developers. I really need a mentor in something like .js or .php so any advice on finding mentors like that is greatly appreciated. I think Thinkful becomes costly when you sign up which isn’t really my cup of tea. Don”t waste time learning everything from scratch, use available tools and frameworks to make workflow faster. For example as a beginner or intermediate developers you can use Twitter Bootstrap and foundation framework to create responsive design, no need to waste time learning responsive web design from scratch. Use Emmet for faster coding sitepoint.com/faster-workflow-mastering-emmet-part-1/ may be helpful. You’re welcome John, happy to share what I’ve learned over the years. You’re welcome Huong. I think that the “Stay active” point is the most important from all the tips. Thanks for the advice sir! You’re very awesome and inspiring. Hope i do well in the future, im a web development student and looking forward to be a Front End Developer in the future! I am very eager to learn and i think your tips will help me a lot. Thanks for sharing! btw. I wanted to ask, if you know about some good website, where I could hire some good html/css coder from India or other eastern countries? Once more, thank you very much. I’d like to translate and share this article for korean guys, if you agree with it. Here you can also found an interesting information about front end development. Great Tips & advice, such a great ressource to regain focus and self-motivation (Helpd me to know what should I learn and what to do to keep the good things up, after a very very long nap – I felt retarded after I read about PHP 7, If you know what I mean XD). I so greatful for the links you provided, and looking forward to exlpore them all, that is a very good thing which will save me priceless time looking for deferent types of ressources. Hope I stil have a good english, take care dear Petr! You’re welcome Salaheddine. Which of the points have you found the most helpful? But the most imorptant thing for me is that you gave us such helpful links to many good ressources, and that is the most heplful thing. After holidays I am working from tomorrow. This article is like a power pack. This sentence “Being honest is the key, but also make sure you don’t say no to everything.” For me very useful! A small typo “It’s ok if things are taking longer then initially planned, but it’s not ok to keeping this for yourself.” then -> than! Very straightforward and useful article. Especially I liked the part about investing time for self development. Most of the time developers don’t work on their selves and so use the same junk of code over and over again while there are new frameworks and libraries coming up. At any time the demand in the market may shift to new framework as now there is huge demand on bootstrap development, so we always have to update our knowledge. Once more, thanks for this article. Awesome content. Pretty much useful. I’ve decided to follow all of ’em. Thanks for writing it. It helps me a lot on how to a face client and bosses when there is upcoming project. And especially taking care of your health. Thank you for sharing Tips. It’s looks like common but very very helpful. I will escape from drown in the sea of average developers.!! Thanks for sharing such a grate, very informative and useful article to front end development tips. Thanks for sharing such a great, informative and useful article about how to become a better front end dev. I love how detailed and interesting your post is. And at the same time it is also informative.